Stone Description: Full range of Capricorn products from sawn to size, to broken quarry rock and pebble. 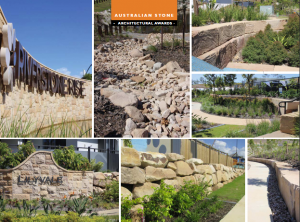 Products predominantly sourced from the re-purposed materials, 30000 tons used in retaining walls and landscape rock. Over 200m3 used in entry statements, feature walls and parklands.